Texas at the Table was a gathering of local, state and national leaders to coordinate efforts to end hunger in Texas by 2015. Lots of people in suits (me NOT included) gathered at Baylor University to launch a Food Policy Roundtable that will tackle this issue. This gathering was organized by the Texas Hunger Initiative and included Todd Staples Texas Commissioner of Agriculture, Max Finberg Director of Faith Based and Neighborhood Partnerships USDA and Julie Paradis Administrator for Food and Nutrition Services (to name the big wigs). There were also plenty of little wigs there today. Many folks I know from Waco and other non-profits working on sustainable food and hunger issues. I’ll start with the positives and then get cranky. It was awesome to see so many people from so many diverse organizations, agencies, churches and faiths (one Muslim representative from Houston) gathered together for a common goal. All of the politicians said the right things and we all applauded at the appropriate moments. Clapping for cliches does not make change, but it does rally the troops and inspire people. Jeremy Everett of the Texas Hunger Initiative did a great job of putting a human face on hunger and clearly pointing out that the resources are already available and allocated to do the job. Camille Miller from Texas Health Institute did a good job asking us to put a face on hunger and pointing out where some of the gaps are in our knowledge and network. Waco’s Mayor Dupuy recently visited Saudi Arabia and found that they had a food reclamation program that curbed food waste in their country. Why can’t we do that in the United States? We have a great mayor in Waco! Baylor, as always, does it up fancy. They pulled out the good china for this event and touted a menu all from local Texas farmers. Unfortunately these local farmers remained anonymous and I cannot corroborate what local meant in this particular meal. Texas is a big state and if everything in Texas counts as local we might as well stick with California produce. I requested the vegetarian entree and almost shrieked when I saw the ASPARAGUS on my plate… in November… in Texas! This was wrong on so many levels, particularly considering the event’s claim to support local farmers. It was also disconcerting to see the coffee labeled “free trade” when they clearly meant “fair trade.” I applaud Baylor’s steps to start efforts to compost and reclaim food waste on campus, but there is clearly a long way to go for them to grasp the full concept and implications of sustainability. This highlights the need to be on our toes to spot the difference between appearance and reality. Even well-meaning people using terms like “local” and “sustainable” need to be held accountable and educated about the reality. As I said, Todd Staples said all the right things. There was one question I wanted to ask him. He touted the agricultural products of Texas. We’re #1 in cattle, of course, and cotton and mohair. The problem is we can’t eat cotton and mohair. We also know what kind of beef our corn-fed cattle are producing and it’s part of the problem. 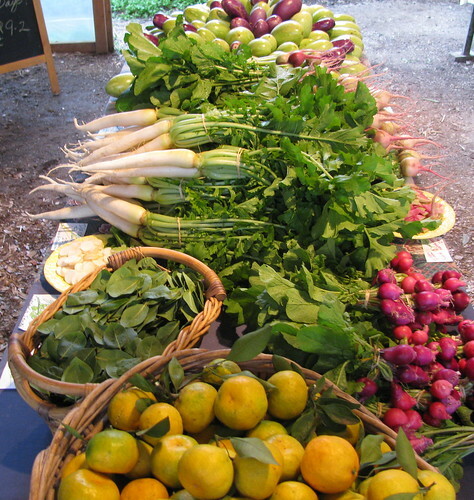 What is the Texas Department of Agriculture doing to encourage more fruit and vegetable production from small diversified farms in the state? If you’re reading this Commissioner Staples, just reply in the comments. The breakout session on local food access was very good. I asked a question about better connections between Texas Agrilife and folks who are trying to do urban/community gardening, but don’t have any gardening or agriculture skills. This is a barrier for a lot of people and the A&M extension system could be a great resource for those people to get the help, knowledge and training they need. Unfortunately the system is not set up or able to do that the way it is currently. The emphasis is different in each county. Agents, particularly in urban counties are more likely trained in turf grass and landscaping. They need to also help the urban and community gardening people. Finally, John Garland had the best quote about food deserts. In the Rio Grande Valley people have to drive 20 miles to get to a grocery store. They drive through miles of land producing food to get to that grocery store. I’m excited about the possibilities, but there is a lot of work and a long road ahead of us just to accomplish something that should already be happening. Let’s get busy. photo from Boggy Creek Farm Austin, TX.